Mark Twain’s most lucrative book was actually blank. Twain was a lover of scrapbooks and was often seen carrying one with him. Growing tired of working with harden paste and losing the glue, Twain set out to make a better type of scrapbook. 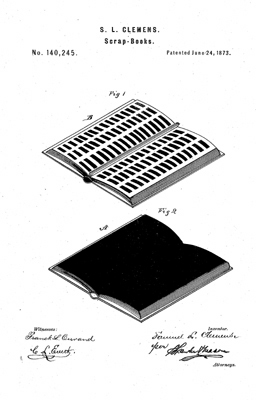 In June of 1873, he received Patent #140245 for improvement in scrapbooks. His scrapbook pages were self-sticking. Thin strips of glue were printed on the pages to make updates neat and easy to do. Twain also patented a strap for holding garments and a game for remembering dates but his scrapbook was the only one of his inventions that was profitable. 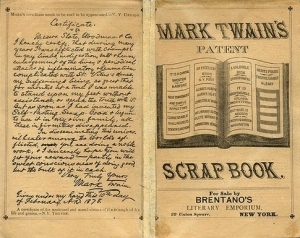 Twain praised his book as the “only rational scrapbook the world has ever seen.” The item named Mark Twain’s scrapbook sold 25,000 copies. By 1901, 57 different types of the scrapbook were available. According to an item in The St. Louis Post-Dispatch (8 June 1885), Twain made $50,000 from his scrapbook and $200,000 for all of his other books combined.